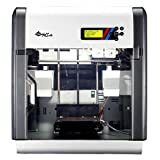 XYZprinting Da Vinci 3D Printer! da Vinci 3D Printers – Should I Buy One or Not? As in this episode we will be discussing the XZY Printings da Vinci line of 3D printers. There is a lot of buzz on the internet, are they good are they bad the camps are clearly divided. So with the holiday season here figured it was worth taking the time share all of the good and the bad with you so you can decide on your own if the da Vinci is right for you! Below are Amazon links to the various da Vinci printers and filament because as one of the tips I share in the video is that buying from Amazon has solved many of my issues in general with purchases of this type. So get a bowel of popcorn, put your feet up, watch the facts and decide for yourself!